Birmingham-based researchers have been at the forefront of the battle against the deadly Ebola virus in West Africa using new cutting-edge methods and technology. Despite a co-ordinated international response to the outbreak, it has proved extremely difficult to control but recent advances in the development of genome surveillance could change this in the future. Genome surveillance provides the ability to sequence the genetic code of a disease-causing microbe or pathogen, providing an unprecedented insight into how genomes evolve, their likely origins and how they can infect humans. Until recently, genomic surveillance has been restricted to conventional, well-equipped laboratories in academic centres, typically employing sequencing instruments costing hundreds of thousands of pounds. But researchers at the University of Birmingham, backed by the National Institute of Health Research Surgical Reconstruction and Microbiology Research Centre (NIHR SRMRC), have been working on a new technique for portable, real-time surveillance. The aim is to improve the medical services’ ability to react to outbreaks like Ebola and other pathogens. 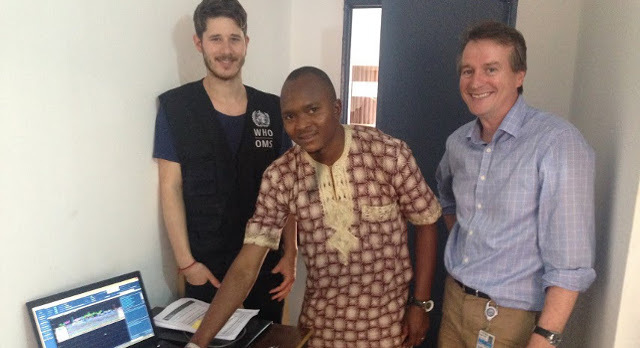 In April, Josh Quick, an SRMRC bioinformatician and PhD student at the Institute of Microbiology and Infection at the university, travelled to the epicentre of the outbreak in Guinea taking a portable genomic surveillance system carried in his hold luggage. The system contained several MinIONs – portable ‘USB stick’ sequencers developed by the British company Oxford Nanopore – as well as all the chemicals and equipment needed to generate sequences of the Ebola virus. He set up in the European Mobile Laboratory serving the affected regions of Guinea and Sierra Leone and within two weeks generated 14 Ebola genome sequences. The sequences were generated in as little as 48 hours from taking a patient’s blood sample and the information generated used by medical experts aiming to stop any further spread of the virus. “Genomic surveillance is increasingly important for detecting and managing outbreaks. We hope the ability to provide portable, real-time sequencing will improve our ability to respond in future,” said Dr Nick Loman, head of the research team in Birmingham. “As of last year, the only way to practically sequence Ebola genomes was to export samples to specialist laboratories, resulting in delays obtaining local permissions and significant challenges securing export permits and procuring expensive shipping to transport samples. “Samples would be received in poor condition, and then the genome sequences could take weeks or months to generate. “We have now shown that this can be done in less than 48 hours from receipt of a patient sample. “A positive development during this outbreak has been the rapid development of vaccines and vaccine trials. Josh left behind in Africa a fully functioning surveillance laboratory, which is now being run by the European Mobile Laboratory in Coyah to provide genome sequence information in real-time. Closer to home, genome sequencing is becoming mainstream with the Department of Health having announced a project to sequence 100,000 patient genomes. Armed with new technologies, it may soon be possible for individuals to sequence their own genomes and for infectious pathogens to be sequenced at home or in a GP surgery.